Ballast Point's Sculpin is a great beer! I love spicy hot peppers! So Habanero Sculpin seems like a dream right? Well, let's see. I grabbed a bottle a few days ago. 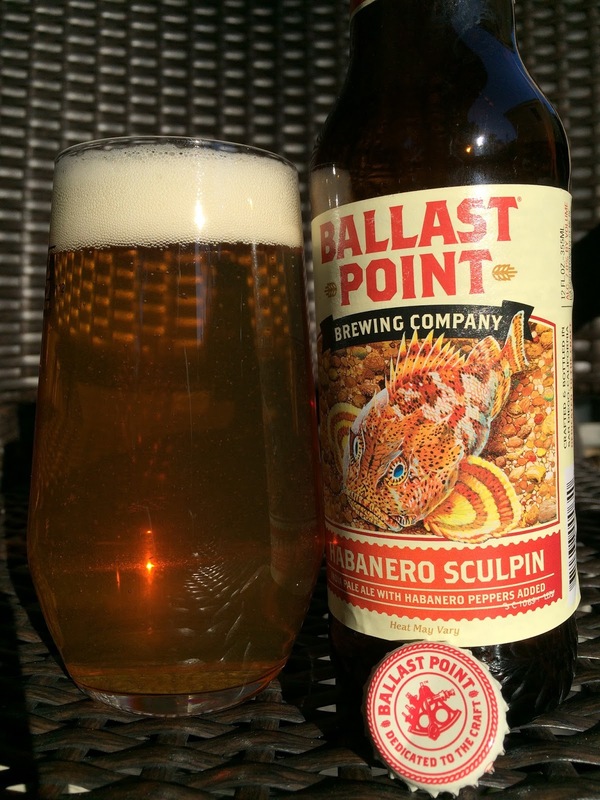 The label shows that same scary Sculpin fish as their other expressions of this beer. At the bottom... "Heat May Vary" LOL. 7.0% alcohol. Nice fruity aroma, need to look for the spiciness. HOWEVER, WOW, you don't need to look for the spicy heat when you take a sip! Habanero Heat is dominant, prominent, massive from the time it touches your lips. Speaking of lips, mine are still burning along with a persistent sting in my throat! Heat doesn't really subside, but after a few sips you will probably start identifying the citrus and orange and other beautiful Sculpin flavors being held hostage by this invader. While perceptible, the base beer is totally muted and covered up. And what a shame. Even if Ballast Point cut the amount of peppers by 90%, I think that would still be too much to make an interesting drinkable beer. Pass for sure!